"Great value! Perfect for my 10" Cast Iron Skillet!" "Love the vent hole to prevent spillover and the fact that it can be used on a variety of cookware sizes." The Best Multi-Size Lid on the Market Right Now! -FUNCTIONAL DESIGN: High heat resistant and food safe silicone rim with different diameter sizes, 8.7" - 10,2" (22 - 26 cm) and vented tempered glass so that you can see inside the cookware as you cook. This large lid is perfect for pots, cast iron cookware, skillets, fry pans, saucepans or any other cookware that you need a lid for. -EASY TO USE: Simply put the lid on your cookware and cook. -The thick high-quality silicone knob stays cool for easy, safe use and is not too high for easier storage. Can also be stored upside down in a skillet to save space. The knob is oven safe up to 400 degrees Fahrenheit. These lids can sit upside down on the knob. -DISHWASHER SAFE: Clean by hand or in a dishwasher. -The vent hole is for exhaust under high temperature and pressure. Prevents spillover with the steam-release vent. FUNCTIONAL DESIGN: High heat resistant and food safe silicone rim with different diameter sizes, 8.7" - 10.2" (22 - 26 cm) and vented tempered glass so that you can see inside the cookware as you cook. This large lid is perfect for pots, cast iron cookware, skillets, fry pans, saucepans or any other kitchenware that you need a lid for. The thick high quality silicone knob stays cool for easy, safe use and is not too high for easier storage. Can be stored upside down in a skillet or other houseware to save space. The knob is oven safe up to 400 degrees Fahrenheit. 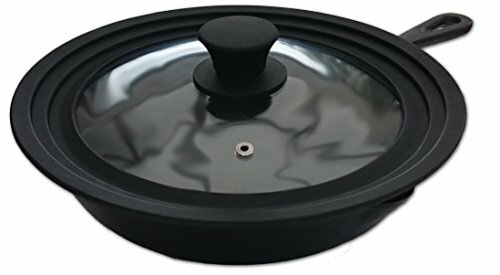 These lids can sit upside down on the knob on the counter so that you can prepare food without fluid from the lid dripping or running and making a mess on the counter. MONEY BACK GUARANTEE: We believe that you will love our Universal Glass Lid as much as we do, but in case you don't, you are covered by a 30 days, no questions asked, money back guarantee. Click the "Add to Cart" button to get your Universal Glass Lid Now! If you have any questions about this product by Crucible Cookware, contact us by completing and submitting the form below. If you are looking for a specif part number, please include it with your message.